We’d love your help. 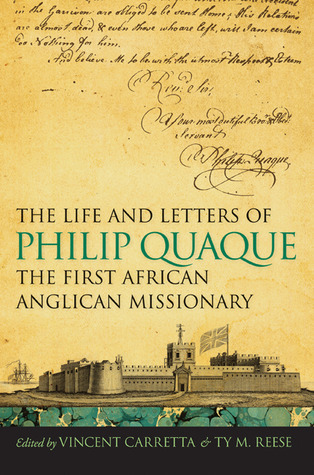 Let us know what’s wrong with this preview of The Life and Letters of Philip Quaque, the First African Anglican Missionary by Vincent Carretta. This is the first edition of the correspondence of Philip Quaque, a prolific writer of African descent whose letters provide a unique perspective on the effects of the slave trade and its abolition in Africa. Born around 1740 at Cape Coast, in what is now Ghana, Quaque was brought to England by the Society for the Propagation of the Gospel. In 1765 he became the first Afric This is the first edition of the correspondence of Philip Quaque, a prolific writer of African descent whose letters provide a unique perspective on the effects of the slave trade and its abolition in Africa. Born around 1740 at Cape Coast, in what is now Ghana, Quaque was brought to England by the Society for the Propagation of the Gospel. In 1765 he became the first African ordained as an Anglican priest. He returned to Africa and served for fifty years as the society’s missionary and also as chaplain to the Company of Merchants Trading to Africa (CMTA) at Cape Coast Castle, the principal slave-trading site of the CMTA. Quaque sent more than fifty letters to London and North America reporting on his successes and failures, his relationships with European and African authorities, and his observations on the effects of the American and French revolutions on Africa. The regular references to his African mission in popular magazines made Quaque well known in the English-speaking world. Initially writing when the transatlantic slave trade went largely unquestioned, Quaque in his later letters traces the period of abolitionist fervor leading up to the ban in 1808. Although his employers supported and facilitated slavery, Quaque’s letters reveal his evolving opposition to both slavery and the slave trade, particularly in his correspondence with early abolitionists. To ask other readers questions about The Life and Letters of Philip Quaque, the First African Anglican Missionary, please sign up. I read this as part of research assistant work. Very well edited collection of letters written by a black Anglican missionary trained at Oxford during the eighteenth century and sent on a mission to Cape Coast during the peak years of the trans-Atlantic slave trade. Interesting insights on African political structures, religious traditions, and gender relations during the period. Vincent Carretta is emertius professor of English at the University of Maryland, College Park.